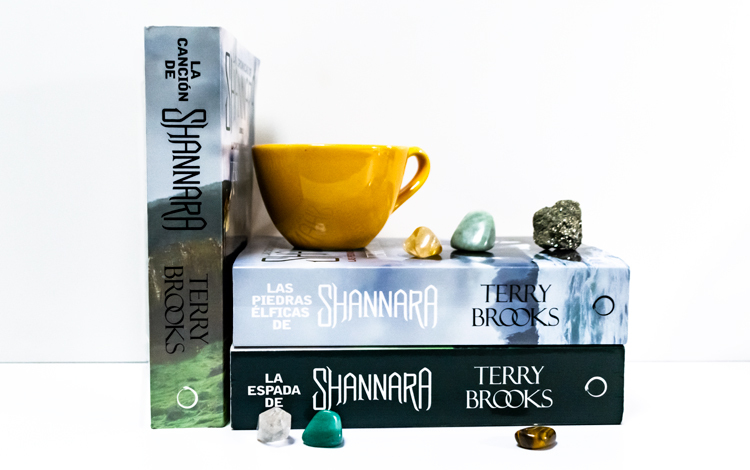 Shannara is a series of fantasy books by the writer Terry Brooks that narrates the adventures of the various members of the Ohmsford family. On this occasion, I come to talk just about the first three books since it is a fairly extensive saga that has more than ten volumes. Some of you will know the series that bears the same name, which “tries” to tell the story of the second book, with a success that I will leave to each one’s judgment. A group of men of different races embark on an adventure to a remote place to get a sword with which to defeat the Lord of Sorcerers. There is a druid, called Allanon, who appears and disappears at will and who always arrives at the right time to help them. Curiously, he fights with a winged and powerful demon to save them and ends up falling into a flaming pit that reaches almost to the very heart of the earth. Men, elves and dwarves are the good ones; and the bad guys are trolls and gnomes. There is a sick king controlled and manipulated by a sorcerer who intends to use him in his favour. In summary, I could continue listing similarities but I won’t do it. In spite of that there is something in the story that hooks you and, as much as you are able to predict its future, you keep reading (I don’t know to what extent it will have that to do with my inability to leave books half unread). Finally, although it is hard to believe, there is part of the book that surprised me, especially at the end. 2. The Elfstones of Shannara. This second book is on which the television series, that is a couple of years old, is based. In this case the main character is the grandson of the previous book protagonist and his mission is similar. Black magic threatens the world again and he, due to his Shannara blood, must help the druid to prevent it. Many years ago supporters of black magic were locked behind the wall of prohibition that was guarded by the Ellcrys tree. But Ellcrys is dying and Will must guide the chosen one to carry her seed to the Blood Fire and back so that the tree can be reborn. I am aware that the series has created opposing opinions but, in any case, the book is worth it. This is the last book of this first trilogy and is starring the children of Will (protagonist of the second book). On this occasion, not to change the argument, black magic has found another way to threaten the world and Allanon needs the help of an Ohmsford to prevent it. Since the arguments are exactly identical in the three books, I must admit that the stories are very different. In this case, the Ohmsford rely on the magic that their voice invokes through singing and that allows them to do practically anything; the mission is to destroy the Ildatch, a book that houses all the secrets of black magic. Several things have caught my attention in this book in particular. In the first place, the fact that the protagonist’s place is shared, for the first time, by a boy and a girl; besides, the suffering of the characters is much more relevant and has more presence; and to finish important characters die, quite a surprise considering it rarely happened in the previous books. I dare say that this has been my favourite so far. As a conclusion and, although it has not been my favourite fantastic saga, I recommend it. The fantastic world that he creates is a truly incredible and the stories, although repetitive, are entertaining. In general, I give it a 7/10. What other books do you recommend me?